Reefers are refrigerated containers commonly used for transporting perishable goods such as meat, fish, vegetables and fruit. Nowadays, reefers are responsible for 40% of the total energy consumption of container terminals, when connected to the electricity grid on shore. Every time when a large number of reefers is plugged-in after arrival, peaks in energy consumption occur. As container terminals purchase energy using a demand-based fee, exceeding the reserved capacity during peak times increases the energy costs of the terminal significantly. So far the literature has not dealt with the root causes of peak energy consumption of reefers, or ways to reduce these peaks. The aim of this paper is to identify the root causes and to quantify their importance. We use data of energy consumption of reefers at a large container terminal, over the period of 1 year. In order to identify the importance of factors, we apply a sequential multiple regression analysis approach with backwards feature selection. Variations in energy demand are explained for 77% by the arrival pattern of containers, for about 5% by dwell time and for 2% by other factors, such as container temperature at plug-in. Promising approaches to reduce peak energy consumption of reefers includes dynamic pricing, energy management and specific peak shaving strategies. With the continuous increase of population and welfare across the globe, ports become increasingly important for the trade and supply of goods and support a continuous worldwide demand for fresh food, throughout all seasons of the year. To ensure the availability of fresh products, specialised refrigerated containers are used. The usage of refrigerated containers (or reefers) has grown together with the world population and global container usage, at a compound annual growth rate of 3.1% between 2012 and 2017. Also, factors play a role like healthy eating habits and change of weather conditions (Dekker 2014). The United Nations Conference on Trade and Development (UNCTAD 2015) reports a refrigerated cargo share of the total dry cargo of 1.5% for the years 2000 to 2015, with an annual growth rate of 45%. The proportion of reefers in total conditioned shipping transport increased from 47% in 1990 to 75% in 2014; it is expected that in the coming 5 to 10 years global growth of the reefer market will be around 8% per year (Rodrigue and Notteboom 2014). Not only the energy consumption of deep-sea transport increases but also the energy consumption of container terminals. Wilmsmeier et al. (2014) found that reefers account for as much as 40% of the total energy consumption of a container terminal. The other 60% is assigned to ship-to-shore cranes (40%), terminal lightning (12%), and administration and workshops (8%). The large proportion of electrical energy usage of reefers at container terminals shows the importance of smart and active energy use systems. Global containerization has led to increasingly larger ships being built and used. This increase in ship size, together with seasonality effects, lead to high peak energy consumption at container terminals. The seasonality effects are determined by the outside temperature combined with the harvest season of fruit. Also, with the use of larger ships, peaks increase in amplitude, due to the high volume of simultaneous reefer arrivals. The operational nature of terminal processes with large simultaneous reefer arrivals presents significant costs for the container terminal. The container terminal is required to unload, and temporarily store the incoming reefers before they can be transported further. During the temporary storage of reefers, the core temperature must remain within the set bandwidth. Thus the reefers are continuously powered when stacked. The container terminal must purchase the required energy at an energy utility company in advance. Often container terminals purchase electricity using a demand-based fee; billing is based on a specific capacity which is reserved by the utility company for the terminal. Any (temporary) peak above the reserved capacity will have a significant impact on the total energy costs (ABB 2017). These costs are high as the energy utility company must ensure the continuous supply of electricity. Therefore, they must supply the exact amount of required energy across their entire network. The extra costs of delivery are passed on to the terminal. The exact height of the additional rate varies with each contract and supplier. The measured maximum peak consumption is then also applied in the billing for the next 12 months (Heij 2015). Currently the container-terminal charges the additional costs to the shipping company. Via the shipping company and importer, the consumer eventually pays for the high electricity costs (ECT Delta terminal 2017). This way, the terminal does not notice the added costs. However, with the current trend of companies looking to become more sustainable, there is increasing attention for ways to reduce electricity consumption. If the electricity cost decrease, the cost of operations also will decrease, leading to a more competitive transhipment price for reefers. One can observe many studies with a technology-focused view regarding the power consumption of reefers. There is extensive research into advanced and smart control systems which regulate cooling of reefers based on weather, energy price (Barzin et al. 2015; Barzin et al. 2016) or control systems that throttle the fans such as QUEST II (Lukasse et al. 2013). However, the focus of these studies has mostly been on the saving potentials of individual reefers (Lukasse et al. 2013; Sørensen et al. 2015). The complete reefer system at the container terminal has been investigated in previous research of van Duin et al. (2018). Although these approaches are a logical steps, when research aims to reduce energy consumption and peak energy consumption, these approaches can also be considered to be symptom management. To date, no research can be found that attempts to explain and break down the energy consumption of reefers into the causal factors, although partial studies on aspects of the problem are available. A literature review was carried out using sources indexed in Scopus, with the key words ‘energy use’ and ‘reefer’. Vanek and Sun (2008) introduce an optimization model to explore the trade-off between the energy consumption for food distribution activities and the loss of energy in terms of nutritional values resulting from food spoilage. Fitzgerald et al. (2011) show that the power consumption of refrigerated containers on site may vary by approximately 60% compared to the base value of 2.7 kW/TEU. Defraeye et al. (2014) use computational fluid dynamics to show the influence of cooling conditions for orange fruit precooling on the cooling rate and system energy consumption. Gwanpua et al. (2015) designed a tool to assess the impact of alternative technologies, plants, and cold rooms on the overall energy costs and the quality of the supplied perishable products. Gallo et al. (2017) proposes a mixed integer linear programming model to minimize the total energy consumption associated with the cold operations experienced by perishable products. The model supports operational decisions about which route and transport mode to choose and also aids strategic considerations on where to locate a logistics node or infrastructure along a cold chain. Mc Carthy et al. (2018) define in their review the four Pillars of Food Security. One of the important pillars is storage, with related high energy cost. More technical research was carried out by Budiyanto et al. (2019), who investigated the effect of azimuth angle (installation of roof shade) on the energy consumption of refrigerated containers. Like Vrat et al. (2018) conclude in their literature review on sustainable cold chains for perishable food products, there are many different areas that are not adequately addressed by academia despite an urgent need for practicing world. They encourage future research to study the role of proper stacking systems, material handling equipment, and advanced technologies for assuring the quality of perishable products during transportation. Studying the power consumption of these systems is essential for keeping up the cold conditions. What are the root causes of peak energy consumption by reefers at container terminals? To answer this question a schematic view on the reefer process is presented in “Reefer terminal operations: a process view” section. “Identification of factors and data specification” section identifies the root cause factors in peak energy consumption. “Measuring the process” section shows the outcomes of the capability tests on the selected group of critical factors. “Regression analysis on the energy consumption” section shows the main results of the regression analysis. Conclusions and recommendations are given in “Conclusions” section. A process-based view focuses on the reefer operations and the risks following reefer handling. A large risk of reefer handling is long periods of no power supply. For example Fig. 1 shows the registration of a temperature logger during transport from the plant to the end-destination, i.e. the transport of a reefer from the Dominican Republic to the port of Rotterdam. Figure 1 (Left side) shows that the cargo was not pre-cooled before transport; instead the reefers were first plugged in at the departing port. If the cargo was pre-cooled, the cargo would be within the bandwidth from the start of the temperature log. This late plug-in leads to a high energy consumption at the departing terminal. This is a trend often occurring in shipments from South America (Groente en Fruithuis 2017). It is essential that the temperature inside the reefer be controlled to ensure the quality of the perishable goods inside. Failure can result in a costly loss of cargo. If failure results in loss of cargo, the port is required to compensate the owner of the cargo for its losses. Reefers always are filled with valuable cargo thus compensation can cost the port large sums. Therefore, it is essential that reefers are plugged in as quick as possible after the arrival of the ship. Filina and Filin (2008) have shown that power-out periods of reefers are often 2–4 h, which can climb to 6–8 h due to human factors, technological factors, and environmental factors. These power-outs occur twice when reefers are handled in the port. The first time is when the ship arrives in the port, the reefer is disconnected from the ships power-net to prepare it for ship-to-shore transfer. The reefer may be transported to a customs check (see ‘GPKW’ in Fig. 2) before it is transported further to the reefer stack. The reefer is plugged in again when it arrives at a reefer stack of the container terminal where it can be plugged into the power-net of the terminal. The second time happens when the reefer is transported further from the container terminal. 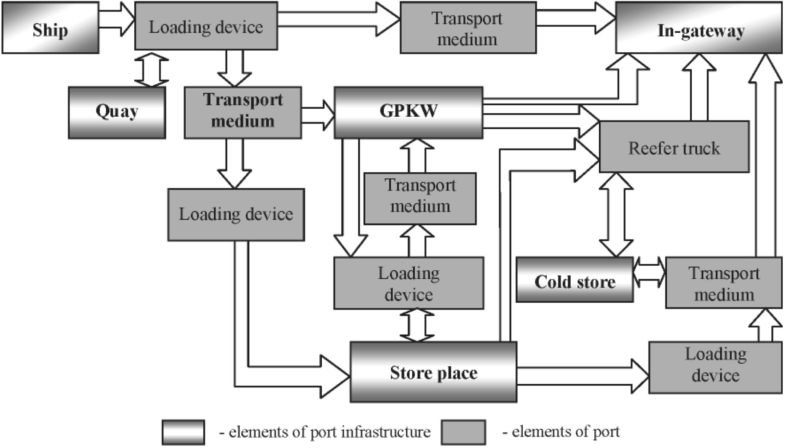 The transport activities of a reefer within a typical European port are shown in Fig. 2 (Filina and Filin 2008). When the reefer is plugged into the power-net of the container terminal the onboard refrigeration unit can control the temperature of the unit. The container terminal then continuously monitors the correct operation of the reefer. Some reefers can be monitored on distance; other reefers do not have the capability of sending data to the control centre. These reefers are checked manually three times a day (Delta reefer care 2017). Filina and Filin (2008) state that the temperature control of reefers is compromised on many occasions due to human factors. As an example, the extended plugged-out period can be caused due to an early plug-out on the ship before the arrival of the ship. An early plug-out stimulates a quick ship offload, however it increases the off-line time and power consumption of the terminal. Another common factor is the failure of plugging the reefer in the power net, as it is known that the reefer will be moved within a short time frame. To determine the possible factors causing high peaks in energy use, firstly a brainstorm was conducted to gather as many causal factors as possible. The brainstorm was held with 6 field experts from an energy technology company, a major container terminal and a technical university, all with a working experience of 7 years on average in the reefer sector. By selecting these experts, different perspectives on the process were included. TU Delft provided factors based on theoretical knowledge, while the experts from the ECT Delta terminal and ABB could provide inputs based on close experience with reefers and the energy systems in place. The experts were asked to list a minimum of 5 factors which they suspected to influence the energy consumption of reefers and, subsequently, to rank these in order of importance. All experts returned with a list of minimally 7 factors (ABB 8; ECT Delta terminal 7; TU Delft 9). 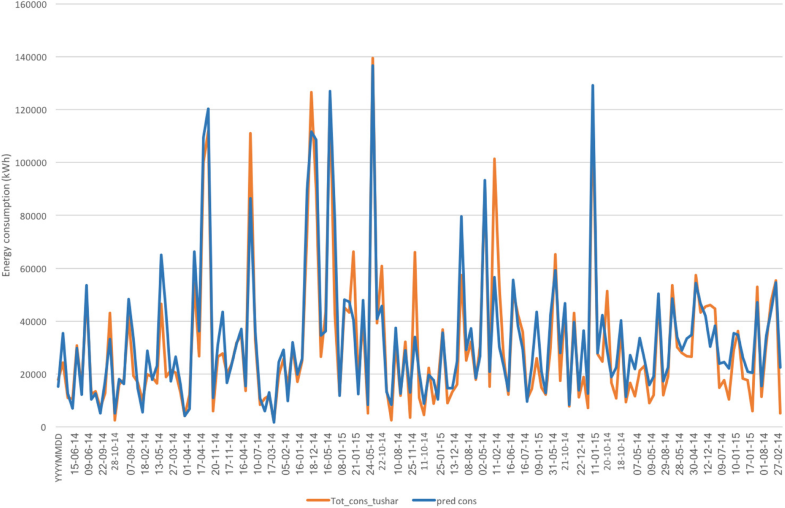 After all the factors were gathered, they were filtered on duplicates based on double mention or similarity of the metric used. Next, the factors were organised in a root cause diagram (Ishikawa diagram). This supports further brainstorming for root cause factors as it follows the 6 M principle of Six-sigma (Eckes 2005). The 6 M principle divides the root cause diagram is six categories: Manpower, Machine, Mother-nature (environment), Method, Measurement, and Materials. The resulting Ishikawa diagram is shown in Fig. 3. The principle of an Ishikawa diagram is that for every branch of the fishbone, at least one factor must be identified. This forces the brainstorm session to think about every aspect of a process. Not all factors that are described in Fig. 3 can be measured directly. Some of the factors must be quantified by using an indirect method of measurement. The number of arriving reefers, sun-hours, set-point temperature, thermal insulation, and mass of cargo are operationalised by measuring the exact factor. These are referred to as the variables No_arr_reefers, Sun-hours, T_set_point, Thermal_iso, and Weight respectively. The ambient temperature is operationalised by using the ΔT between the set-point temperature and the average ambient temperature. This difference is referred to as the variable Delta_T_ambient. The plug-in temperature is operationalised by using the ΔT between the plug-in temperature and the set-point temperature. This is referred to the variable Delta_T_plugin. The offline time is calculated using the equations developed by Tran (2012) and referred to variable Offline_time. The calculation of the Dwell time is the difference between the plug-in and plug-out time of the reefer and referred as the variable Dwell_time. The type of cargo can be operationalised using two methods. It can be either represented by the set-point temperature or the specific heat. In this research, we chose to represent the cargo type using the specific heat of the cargo. The specific heat is referred to variable Specific_heat. The power availability is difficult to operationalise as no data is known regarding this factor. Therefore this factor will not be considered in this research. The dataset used for this research was provided by utility company ABB. The data is measured and collected from a container terminal over the course of 1 year and 1 month. The inputs of the original dataset as supplied by ABB states a container number, container size, plug-in time, plug-out time, set-point temperature, and weight. 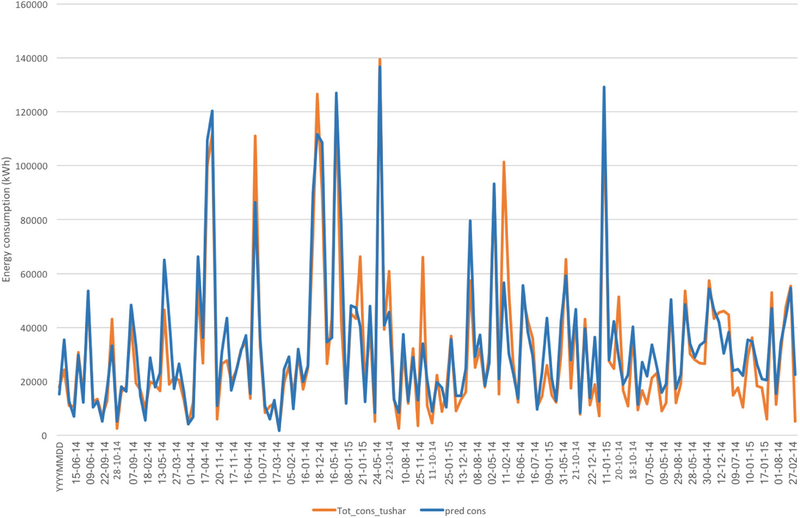 These inputs were measured over the period between 01 and 01-2014 and 23-01-2015. During this period 65,732 measurements were collected, each measurement for a single container. To measure the performance level of a process, a standard must be available. The Critical-To-Quality (CTQ) requirements of the customer must be translated to performance standards so that current performances can be measured against this benchmark. For each of the CTQ requirements it is asked what specifications the customer demands. The following process standards are specified (Table 1). The requirements and allowed deviations for the temperature control are deducted from the set-point temperature of the reefers. Reefers can be set to maintain any temperature between − 30 °C and + 30 °C (Hamburg Sud 2016), thus for all reefers, the exact specification of the temperature requirement can be different. There are some reefers capable of maintaining a temperature of − 60 °C. However, these reefers are not standard practice and not often used. Table 1 shows the allowed temperatures for standard temperature ranges. The maximal offline time is calculated using the approach of Tran (2012). The temperature bandwidth per reefer is known; thus the ΔT (t) between the set-point temperature and bandwidth limit is used to calculate the time the reefer takes to warm up to the bandwidth limit. Using this information the maximum offline time is calculated for each reefer. These equations assume that the temperature increase follows a linear pattern and that the reefer is at its set-point temperature when the reefer is plugged out. The value of the maximum offline time can differ for each reefer. Short transhipment time criteria are measured by the dwell time per reefer. If the dwell time is short, then the entire transhipment period is short, and the customer can transport the reefer to the hinterland quicker. Also, if the dwell time exceeds the “demurrage free time”, the customer is required to pay an additional fee. For reefers, the additional cost can be up to €120 for the first 3 days above the free time and €180 for four or more days above the free time (ZIM 2017; APL 2016; CMA CGM 2017; OOCL 2016). Plus additional electricity costs are billed to the customer (LLC Maher Terminals 2016). Typically the free time can vary between different terminals and different customer contracts. However, larger terminals often handle a free time period of 3–5 days (LLC Maher Terminals 2016; APM terminals 2018). Therefore, the transhipment time is specified at 1 day with an allowed deviation of 2 days. This time limit ensures that the customer does not have to pay additional fees. The peak energy bandwidth of the container terminal differs for each terminal due to individual contracts of the container terminals with the energy utility company. Therefore a maximum allowed peak load is assumed. The maximum allowed peak consumption is assumed to be 80.000 kWh. The analysis on the current process capability gives an insight into the operation of the process and an indication of what parts CTQ requirements are out of control. No accurate bandwidth data is available as the specific bandwidth is different per reefer. Therefore the bandwidths for the specific temperatures as mentioned by Rodrigue (2014) are four categories. Therefore the data is split up into four categories: deep-frozen (− 66 °C to − 29 °C), frozen (− 28°to − 10 °C), chilled (− 9 °C to 10 °C), and bananas (11 °C to 27 °C). The corresponding bandwidth is assumed to be + 2 °C, + 2 °C, + 1 °C, and + 0,5 °C respectively. The result of the analysis is shown below in Table 2. In this table “defects” stands for the number of times that the temperature inside the reefer exceeds the allowed bandwidth. Dpu is the average number of defects per unit, the FTY is the First Time Yield (FTY equals to e-DPU¡), P(d) is the probability of a defect (equals to 1-FTY). The Z factor is an important indicator for the process capability and indicates the sigma score of the process (equals to (SL-Xavg)/ σ). The standard deviation is given by σ, the median is the center of each category. Table 2 shows that the temperature control of all reefers in every category is rarely out of the allowed bandwidths. In almost all cases 99% of the reefers stays within the allowed temperature range. The deep-frozen reefers score relatively lower with 93% of the reefers that stay within the allowed specification. The high performance of the temperature control is confirmed by multiple Dutch importers of meat, fish, fruit, and vegetables who indicated that their temperature loggers rarely show that the temperature has been outside the specified bandwidth. To guarantee continuous temperature control, the offline time per reefer must be minimal. Hence, the reefer must be plugged out as late as possible, then offloaded, stacked, and plugged in as quick as possible. In this process, the terminal attempts to unload the reefers, as soon as the ship is docked, within 1–2 h (ECT Delta terminal 2017). However, according to the terminal, it often occurs that the reefers are unplugged at sea due to lack of personnel or to save money by not using more expensive fuel to power the reefers (a higher quality of fuel is required when the ship enters European waters). In the ideal situation, the reefer would be plugged out when the ship is docked and plugged in 1 h later on the shore. However, modern large container ships only have a crew capability of approximately 13 people (Maersk Emma 2017). This means that it takes often longer to unplug all reefers. According to the Port of Rotterdam (PoR) the time it takes to get from the north-sea to dock the ship at the terminal is on average 1 h. Assuming that all crew must be available to dock the ship, the reefers must be unplugged before entering the port. Furthermore, when 500 reefers must be unloaded from a ship, the quay cranes are capable of unloading these in 3.1 h. Thus, the reefers must be plugged in after approximately 5.5 h. This is the total sum of the times it takes for the ship to dock (1 h), the offloading period of 3.1 h, and a deviation of 1.4 h. With this specification limit, the capability of the offline time is calculated and is shown in Table 3. Table 3 shows that 58% of the reefers is plugged in at the reefer stack within 5.5 h. As expected, there is no large difference between the different categories. This was expected since the terminal is not able to select which reefer types are unloaded first. It must be noted that the low Z-score of the offline time performance has no apparent influence on the temperature control. As shown in Table 2, the temperature of the reefers is rarely out of the selected bandwidth at plugin. Hence the poor offline time performance has little risk of damaging the value of the perishable goods. However, the high average offline time can influence the energy consumption at the terminal. For the determination of the transhipment time capability a limit of 1 day with an allowed deviation of 2 days is used. Thus a defect is reported when the transhipment time exceeds 3 days. This specification is chosen based on a large container terminal (APM terminals 2018; LLC Maher Terminals 2016) as they often have a so-called “demurrage free time” of 2 days. Large customers can negotiate longer free times at the terminal using contracts which are not publicly available. Therefore, during this research a general maximum demurrage free time of 3 days is considered to be a defect. Table 4 shows that the transhipment time has a 43% chance to exceed the free time period of 2 days. This coincides with a low Z-score of 0,17. This high transhipment time could contribute to a high energy consumption. The same analysis is performed for the peak energy performance of the process. For this analysis, a defect is considered to occur when the peak energy consumption exceeds 80.000 kWh. The value of 80.000 kWh is chosen as this is a clear cut-off value. The exact value of the limit is highly dependent on the contract between the container terminal and the energy utility company. Considering this upper limit there are 19 moments when the power consumption exceeds 100.000 kWh. This results in a Z-value of 1,64. For the individual reefer categories, it is considered to be a defect when the energy consumption exceeds the proportional limit. I.e. Frozen reefers account for (45,896/61320)*100 = 74.85% therefore the combination of frozen reefers is not allowed to exceed 59,877 kWh.. The results are shown in Table 5. The current process capability was determined by calculating the Z-score. When considering the current performance of the temperature control, transhipment time, and the peak energy performance it can be said that the current process rarely exceeds the allowed temperature bandwidth. However, it occurs regularly that the offline time is longer than 5 h. The exceeding offline time was expected as reefers are often unplugged at sea. Also, the complete transhipment process often takes longer than the customer specifications of 3 days. Finally, the amplitude of the peaks also often exceeds the required maximum. It is especially remarkable that frozen reefers often exceed the allowed peak consumption. The regression analysis will show if the found capability limitations of the dwell time and the offline time performance add to the energy consumption. Prior to the regression analysis the brainstormed factors are explored using the IBM SPSS statistical package. The first step in the exploration is to investigate the complete dataset for correlations and trends. For every day of the measurement period (01-01-2014 to 31-01-2015). the average is calculated for each factor. The average of each factor is analysed with respect to the total energy consumption. If a factor has an impact on the total energy consumption, it shows that the total energy consumption increases or decreases with a change in the factor. The Pearson correlation matrix indicates the direction. Strength and significance of the bivariate relationships of between all above-brainstormed factors. The summary of the matrix is shown in Table 6. Table 6 indicates that seven factors have a statistically significant correlation with energy consumption (flagged with *). The largest correlation is between the total energy consumption and the number of arriving reefers. Furthermore the dwell time, delta plug-in temperature (ΔT), cargo type (specific heat), thermal insulation, weight. and ambient temperature appear to be correlated with total energy consumption. It is noticeable that the factor “Sun-hours” is not-significant where this was not expected. The offline time is not directly statistically correlated with the total energy consumption, although it often assumed that this has a considerable influence on the energy consumption of reefers. After the exploration of the data, a general idea of the influence of certain factors on the total energy consumption is made visible using a correlation matrix. The next step is to perform a multiple regression analysis. Such an analysis enables us to predict the total energy consumption per day. A sequential multiple regression analysis, using the IBM SPSS package, is selected for the analysis. This selection is made based on the decision tree presented by Tabachnick and Fidell (2013, p.29) as there is one continuous dependent variable, multiple continuous independent variables, and there might be covariates. Also, the goal of the analysis is to find the optimal combination of influencing variables to predict the dependent variable. These characteristics lead to the sequential multiple regression strategy. To perform a proper regression analysis, the appropriate factors which are included in the analysis must be selected. This is done by using an automatic model for the selecting of factors. An overflow of factors in the regression analysis can lead to an inaccurate analysis. The model can be selected using different automated methods. These automated selection methods can be used if there is no large collinearity, no large number of variables compared to the number of observations, and no ordinal/nominal data is used. The data used in this research complies with these requirements thus the automatic model selection methods can be used. The dataset used for this regression analysis has 393 observations (1 year and 1 month), nine possible independent predictors, and no collinearity problems. The Backwards selection method is used with an α-boundary of 0.05. Backwards (step down) selection is the most straightforward method of model selection. In backwards selection, all predictors are initially entered in the regression. Next, the predictor with the highest P-value above the threshold of a chosen α is removed, and the model is refitted with the remaining predictors. Again, the predictor with the highest P-value is removed. The procedure is repeated until all predictors have a P-value of less than the chosen α. The outcome of the backward sequential regression analysis is shown in Table 7. Table 7 immediately shows that the backward selection removes four factors from the regression analysis. Three of the removed factors are expected as these were found to be insignificant in the shown correlation matrix (Table 6, i.e. Set-point temperature, Sun-hours, and Offline time). However, the fourth removed factor is the avg_DeltaT_ambient factor which has an α < 0,05 after removing the average temperature set-point, sun-hours, and offline time from the regression analysis. Therefore, the model with the highest R2 contains five root cause factors. As expected the number of arriving reefers explains a significant portion of the variance. The dwell time, plug-in temperature, specific heat, and thermal insulation are the other factors included in the model. Together the model explains 83% of the total variance. According to Tabachnick and Fidell (2013) cross-validation with a second sample is highly recommended for stepwise regression methods. The method of cross-validation is based on the principle that ‘If a model can be generalised, then it must be capable of accurately predicting the same outcome variable from the same set of predictors in a different group of people.’ (Field 2013). Cross-validation of the developed model is done through some steps. Initially, the data is split up into two sections to create ‘the different group of people’ to which Field refers. The larger section is used for the development of the model (model training), and the smaller section is used for cross-validating the model (model testing). Tabachnick and Fidell (2013) suggest that using an 80% and 20% division of the data is appropriate for cross-validation. However, in this research, a division of 60% and 40% is used. Meaning that a random 60% is used for the development of the model as mentioned above and the remaining 40% is used for the cross-validation model testing. The ratio between the training and test section of 60% and 40%, respectively, is selected as this ratio puts an higher emphasis on the testing of the strength of the prediction. During this research, the cross-validation of the identified factors is more important than the accuracy of the prediction. Thus, a ratio of 60% and 40% is chosen. Secondly, the developed regression equation is used to predict the value of the energy consumption of the smaller cross-validation sample. After this, the predicted energy consumption and actual energy consumption are correlated to find the correlation coefficient (R). The correlation coefficient is squared to obtain the R2 for the smaller sample (R240, N = 157). In this correlation analysis, a significant discrepancy between the R2 between the 60% sample (R260) and 40% sample indicates a lack of generalizability of the estimated model (Tabachnick and Fidell 2013; Field 2013). Besides comparing the R2 the Mean Squared Error (MSE) for both samples are also compared. To be able to compare the predicted energy consumption values with the actual values, first, the energy consumption has to be predicted. The prediction is made using Eq. (1). This equation is developed with the unstandardized coefficients as developed by the multiple regression analysis (see Table 7). First, let us visually investigate the predicted total energy consumption versus the total energy consumption as determined by Nafde (2015). Both these values are found in Fig. 4. The Figure shows that both the predicted values and the actual values follow the same trend and seem to be correlated. In two instances the regression equation produces a false and impossible negative consumption value. In these two instances, there are few arriving reefers, and the dwell-time is low, leading to an over-representation of the specific heat which results in a negative power consumption. These outliers are not representative and have a strong negative influence on the analysis. As it occurs only in two instances, these instances can be observed as outliers and therefore removed from the cross-validation set to get a more accurate view of the model’s accuracy. Table 8 shows the descriptive statistics for both the total consumption that was developed by Nafde (2015) and the predicted total consumption using Eq. (1). Considering the values in Table 8 it can be concluded that the differences between the minimum, maximum, mean, and standard deviation are small. Further strengthening the possibility that the model accurately predicts the energy consumption based on the five factors identified. When correlating the consumption predicted using Eq. (1) with the actual consumption it shows that the predicted and actual values have a high and significant correlation with an R-value of 0,877 (P < 0.001). The correlation between the actual and predicted values is squared so that it can be compared to the R2 of the training sample (R260). The R240 of the test sample is R2 = 0.769. It is to be expected that R240 is lower than R260 (0.830), in this case the difference is 0.061. As the model is developed to fit 60% of the total available data, it is logical that the remaining 40% of the data fit the same data, albeit less. Comparing the R240 to R260 doesn’t show a large discrepancy, which indicates that the model correctly and consistently predicts the total energy consumption. The mean squared errors for both the training sample and the test sample are large. High MSE are logical as the values of total energy consumption are large; thus it is likely that errors are large as well. The MSE for the training sample is MSE60 = 152,099,083 and for the test sampleMSE40 = 98,521,931. When considering these MSEs, it shows that MSE40 is lower than the MSE for the training sample by − 35%. A lower MSE indicates that the model would predict the energy consumption for the test sample more accurately than for the training sample which is remarkable. The difference between both MSE’s is significantly large, however as there is no large discrepancy among R2 and the MSE changed positively, we conclude that the model predicts correctly and consistently predicts the total energy consumption. In the global race against energy consumption, the consumption of reefers is a highly important research topic. Previous research shows a focus on technical improvements of reefers and its control systems, but no systematic study of the underlying causes of energy consumption is found. In this paper we investigate the root cause factors of high peak energy consumption of reefers in terminals. We estimate a regression model on possible root causes, using a large dataset of reefer energy consumption at a terminal, and identify the relative importance of each factor. The model is able to explain variations in energy consumption very well (R2 = 0,83 p < 0.001). The regression analysis shows that the number of arriving reefers effects the total energy consumption the most, as this factor can explain 76.6%. The influence of the other factors are as follows: Dwell time accounts for 4.6%, Specific heat for 1,1%, plug-in temperature 0.4%, and thermal insulation 0.3%. In total this explains 83%, the remaining 17% is explained by other factors that are currently unknown. The plug-in temperature, thermal insulation of the reefers, and the cargo type have a negligible impact on energy consumption. The temperature set-point, offline time, weight, ambient temperature, and sun-hours are found to be non-significant. Following the identification of the root cause factors, improvements are suggested to reduce peak consumption. It does not seem feasible to reduce the highest contributing factor to energy consumption: the number of arriving reefers. This relates to the core business of a terminal and is very likely to continue increasing in the coming decades (Dekker 2014; World Cargo News 2017, https://www.worldcargonews.com). As soon as issues of shore power are considered additionally, the topic of peak energy consumption increases dramatically, which is also related mainly to the number of containers transhipped in the port. The difference in plug-in temperature compared to the set-point temperature, thermal insulation, and type of cargo are also not considered for improvement as these contribute minimally, and any improvements would provide minimal yield. Additionally, current international legislation regarding the insulation factor of reefers is sufficient to keep the core temperature of reefers within the set bandwidth during the offline time, without adding significantly to the energy consumption. Therefore, the main improvement suggested based on the root cause factors identified is a reduction of the dwell time. However, reducing the dwell time is likely to result in lower revenue for the container terminal, due to decreased demurrage costs. These are fees charged when a reefer exceeds the demurrage-free time, which is a predetermined time that the reefer is allowed to be plugged in at the terminal without additional costs. As such the terminal has little incentive to implement measures to reduce the dwell time of reefers. For terminals to accept energy consumption reduction measures, these should be at least revenue neutral for the terminal. Further improvement can be sought in revenue management methods such a dynamic pricing scheme and a peak pricing fee. van Duin et al. 2018 also show that peak shaving strategies provide opportunities for cost reduction. Also Lam et al. (2017) show a way to reduce peak energy consumption by implementing an energy management system in container terminals. Dynamic pricing is a complex method which is increasingly applied in a range of industries. Dynamic pricing continuously determines the price of a product or service based on the current demand. From a scientific perspective this could be a challenging research topic; in practice, however, high demurrage costs make the current business model attractive. Two other downsides of a dynamic pricing scheme have to be named. First, a dynamic pricing model assumes that demand can be accurately predicted, which is still difficult for ship arrivals. Second, a dynamic pricing model assumes that the demand for goods or services has a sufficiently high price elasticity. However, the five Dutch importers of meat, fish, vegetables, and fruit consulted in the study have indicated that this is not the case. Considering these two downsides, a peak pricing scheme promises a better yield, and can be considered to be a more suitable solution. Peak pricing introduces an additional fee when a peak in energy consumption is expected and does not require a price-sensitive demand or a highly accurate demand forecast. Bank (2017) showed that efforts to reduce the dwell time of the reefer using the introduction of a peak pricing scheme will lead to a significant energy reduction. If the dwell time reduces to an average of 3 days, the total energy consumption will reductions of between 5,5% and 11%. Although this is a promising result, the effects have yet to be proven in practice. We thank Patrick Vloemans of ABB for providing realistic data on reefer logistics for a sample terminal. 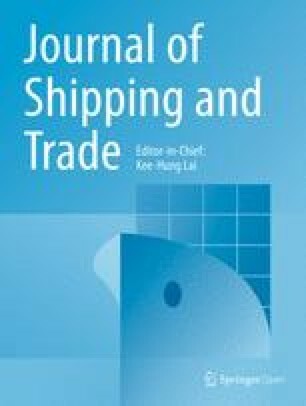 The first two authors are working in research project EURECA (Effective Use of Reefer Containers Through the Port of Rotterdam – A Transition Oriented Approach), with project number 438–15-505, which is partly funded by the Netherlands Organization for Scientific Research (NWO). The data that support the findings of this study are available from ABB but restrictions apply to the availability of these data, which were used under license for the current study, and so are not publicly available. Data are however available from the authors upon reasonable request and with permission of ABB. JHRD wrote the article. The other authors are critical reviewers. All authors have intellectually contributed to the obtained knowledge and insights in this paper. All authors read and approved the final manuscript. Bank DL (2018) Identifying and improving factors causing peak energy consumption of reefers at container terminals. Master thesis. Delft: Delft University of Technology. http://resolver.tudelft.nl/uuid:e7619906-f5f0-4bce-8a48-e45ffa9ca438.